Received an email a few weeks back that the Cooking Web Series I had applied for called Great Tastes of Canada has been put on the back burner indefinitely. I'm a bit upset due to the amount of work I put into the audition tapes, but I also know that things happen for a reason. For instance, we are in talks for season 2 of Backyard BBQ Battle. We need to finalize some details. The amount of feedback and comments that my co-host Bill Pudim and I have received in regards to the show is staggering. Eastlink must be pleased too if they are willing to go with a second season. We think this is a win for everyone. Eastlink gets some fun programming to air, and we get to do what we love.... cook! I'll leave you with the out-takes from my Great Tastes of Canada audition video. Just to put it into context, I made 2 videos. The first was to be a contestant. The second was to be a judge as I had been asked to submit for both. Filming was done mostly alone (camera on a tripod) but Andrea was able to help with some parts as well. During the filming, both kids were here. Trying to film with kids in the background being kids was not easy. It didn't help that I wanted it to be perfect so I did many retakes. Either way, here are the bloopers. They are long (5 minutes) but at least fast forward to the last minute and watch Carter steal the show. 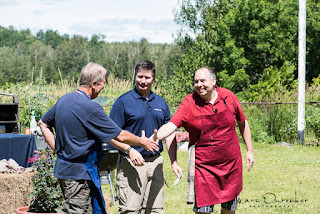 This week, I had the opportunity with my Northern Ontario BBQ Society and TV co-host Bill Pudim, to cook a dinner for 45 locals. Instead of competing against each other, we joined forces and cooked together. I have to admit that Bill did most of the heavy lifting, getting all the long cooked meats done the night before (Brisket and pork shoulder). I arrived shortly after lunch at the scenic Airport hotel in South Porcupine, Ontario to help him with the final prep, take care of ribs and some sides and serve the dinner. We served a typical BBQ platter..... 4 meats (brisket, sausage, pork and ribs) as well as sides (pickles, kaiser, mac & cheese, caesar salad and coleslaw). 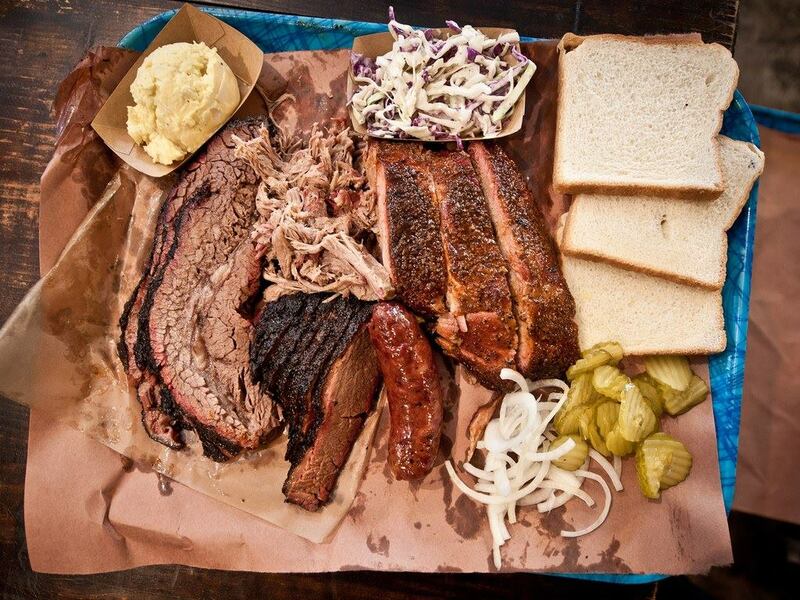 We served huge plates of food on cafeteria trays on butcher paper. It cut down on dishes for sure. Most of the trays came back to the kitchen empty so that was a sign that our cooking must have been up-to-par. our tray looked similar to this one. We received some really good comments about the food. It was a lot of work and I slept like baby but we had a blast. Thanks to some friends who helped out with prep and service (Andy Rochon, Alain Bélanger and Pierre Carbonneau).